Note: This is a reprint of my review for Demolition, which originally ran on September 11, 2015 after seeing it at the Toronto Film Festival. I am publishing it again today as it hits theaters this weekend. Demolition is more about deconstruction than it is about necessarily destroying anything. I mean, things are destroyed, obviously, but not for the sake of getting rid of them. Instead, our main character Davis (Jake Gyllenhaal) is a person who finds liberation in his soul-searching through methods of destruction. In the latest from director Jean-Marc Vallée (Dallas Buyers Club, Wild) we dive into the deep end right off the bat as we are witness to a man losing his wife in a horrific car accident and not feeling a thing afterward. This kind of wake-up call to the fact he’s been living a meaningless life for the past however many years gives our protagonist the need to demolish everything that constructed that prior existence. This realization is of course tipped off by what is typically a heartbreaking event and yet Davis shows no signs of distress or loss thus giving the film something of an edge while still being able to explore the mundane aspects of life that it seems to find so interesting. If the film is anything it is a showcase for Gyllenhaal to display what has made him one of the more credible leading men in a saturated market and for this Demolition thrives the majority of the time. The rest of the time you can feel screenwriter Bryan Sipe (with his first major screenplay) searching for an ending or a way to bring all of Davis' destruction around to some kind of meaningful epiphany, but it never gels. Unfortunately, this trips up a rather promising beginning that has all the momentum in the world in its first hour. 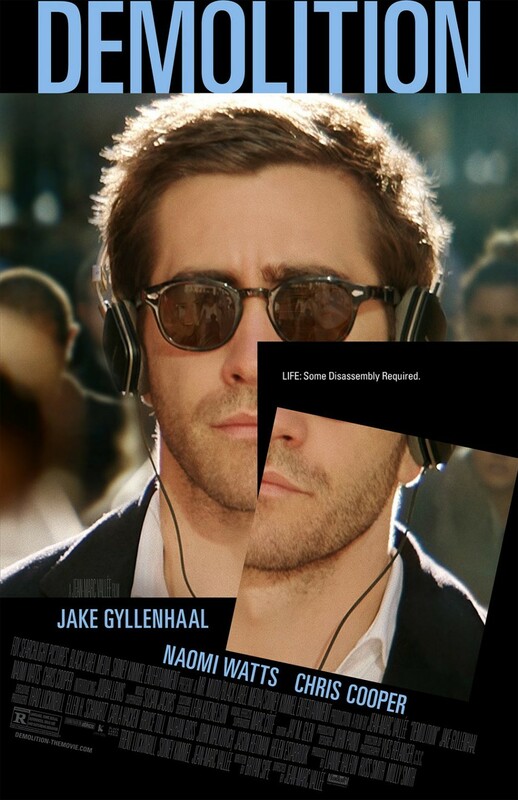 Davis (Jake Gyllenhaal) comes to terms with his life by tearing down all that makes it up. We begin with an introduction to Gyllenhaal's Davis who is a successful investment banker, but a bad listener. He is in the car with his wife, Julia (Heather Lind), who is complaining to him about having still not fixed the leak in their fridge. We can see Davis is in and out of the conversation, but that at least he and Julia have something of a natural rapport with one another. It is without warning that they are sideswiped by another vehicle and only moments later do we learn that Julia died on the operating table as the doctors tried to save her from blunt trauma to the head. Davis' father-in-law Phil (the always dignified Chris Cooper), who is also his boss, delivers the news and is as deeply saddened as one might imagine a father who loses a child to be. Davis only stares blankly before walking over to a vending machine to purchase a bag of peanut M&M's. When the bag of candy gets stuck in the vending machine Davis is frustrated and while at his wife's visitation at his in-laws house he pens a complaint letter to the vending machine company. As Davis begins to unravel and his letters become more personal admissions than actual complaints he and customer service rep Karen Marino (a rather wasted Naomi Watts) form an unlikely connection. Through this strange relationship that forms with Karen and her son Chris (Judah Lewis leaving a strong first impression), Davis begins to try and rebuild. One thing I've begun to notice (and having originally seen this consecutively with so many other films at a festival) is that much of what we're treated to in our high-brow dramas could be easily summed up in what are known as "white people problems" and while that doesn't immediately make a film insincere it does force each individual picture to work harder for an audiences approval. With Demolition being a fine example of this (Gyllenhaal smashes up his pristine, modern home just so he can feel better about himself) it had to have something more to it, something that would allow it to earn that feeling of necessary viewing. While this is certainly not essential viewing I can't imagine anyone feeling bad about watching it once the credits roll. Contrary to this culturally-influenced opinion, the film could be viewed as an analyzation of how different people deal with tragedy in different ways and in this regard the film hits on something specific. As I mentioned before, the first hour or so is more than efficient in not only its pacing, but in hitting its points through story and sharp dialogue. Moments of Davis realizing his wife is actually gone whether it be through seeing a centerpiece on their dining room that he remembers buying together or her hair that remains on her brush in the bathroom, it is the devil in the details that create an affecting mood. The editing is particularly attractive as it weaves from timeline to timeline in order to make the death of Julia ever-present while maintaining the fact Davis finds it difficult to grieve over her death. Vallée uses the editing as a storytelling function rather than just a way to string together incidents, but it's when those incidents get repetitive that not even the free-flowing editing style can save the story. Chris (Judah Lewis) comes to be a helping hand as Davis deconstructs his world. Demolition also features dialogue such as, "Assuming that you're familiar with the Heart catalogue," which may seem rather random, but is well justified in the context of the film and offers Vallée the opportunity to hit some great musical cues that reinforce the rage and energy that Davis feels through destroying things. Embodying this wholeheartedly is Gyllenhaal in his committed and rather funny performance. It is somewhat hard to believe that Vallée and Sipe were able to somehow balance the melancholy tone of the events that set their film in motion with the hilarity of the honesty that Davis adapts after realizing he's only done what other people see as appropriate his whole life, but they manage it and for me, it worked. The idea that no one's ever really honest with each other is fascinating in that we all find it hard to accept we can never truly know what the lives of our friends and family hold. That we so desperately want to and find it hard to accept this truth is where the film both succeeds and fails. For that first, strong hour we are led to believe that Davis is not necessarily a horrible person, just a flawed one who fell into a routine anyone could have, but when the film tries to answer its rather generic and obvious question of what gives our lives real purpose we are treated to resolutions that feel forced through the hand of standard human flaws. It's simply not as satisfying as it should be. That said, I rather enjoyed Demolition. Probably more than this review would make you think, but its highs are as good as its lows with a performance from Gyllenhaal that elevates it altogether and for that it feels perfectly acceptable.